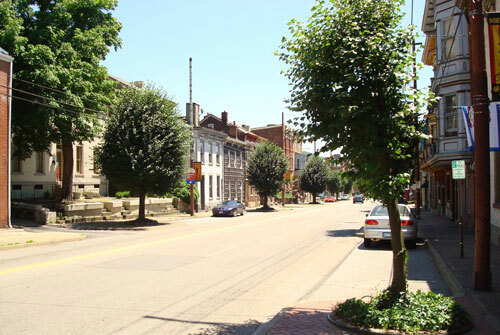 Located along a high bluff above the Ohio River, North Main Street features one of the greatest concentrations of mid- to late-19th Century Victorian-era residences for a city of this size. Nearly 70 buildings, some dating to 1839, remain along the street that is part of the nationally registered North Wheeling Historic District. An ordinance adopted in 2001 established an Historic Landmarks Commission to review new construction and renovations to ensure changes are in keeping with the street's historical character and architectural integrity. Eight blocks between East 1st Street and 9th Street immediately north of downtown Wheeling. 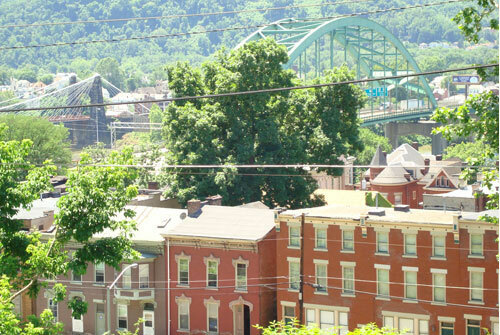 Located along a high bluff above the Ohio River, North Main Street affords scenic views of the river and the historic Wheeling &amp; Belmont Suspension Bridge, built in 1849. Photo courtesy of City of Wheeling. Original iron fences and stone retaining walls define the front yards of some of the homes, which represent styles that include Italianate, Queen Anne, Romanesque, and Greek Revival. Anchoring the northern end of the designated blocks are 62 rental and owner-occupied apartments, townhouses, and single-family homes that complement the Victorian architecture. 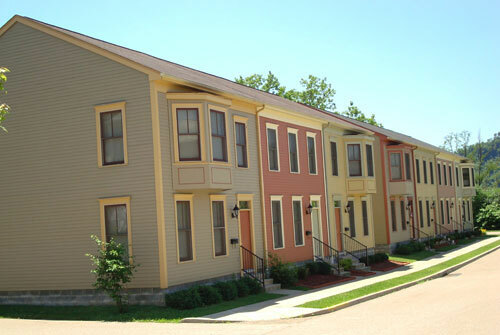 The new homes, some of which meet affordable housing guidelines, were completed in 2002 with a $17 million HOPE VI grant from the U.S. Department of Housing and Urban Development. The street affords scenic views of both the Ohio River and the 1849 Wheeling & Belmont Suspension Bridge designed by Charles Ellet Jr. These homes are part of a $17 million HOPE IV development anchoring the northern end of North Main Street. Photo courtesy of City of Wheeling. Shade trees and curb extensions, which slow traffic and decrease the pedestrian crossing distance, make North Main Street a pleasant place to walk. Photo courtesy of City of Wheeling.